This entry was posted on Saturday, January 2nd, 2010 at 6:09 pm and is filed under Family. You can follow any responses to this entry through the RSS 2.0 feed. You can leave a response, or trackback from your own site. « 2009! Soon to be gone! In two days, it will be one year since my skiing incident of 2009. Today, we went to Badger Pass and tried me out again. I have to say, as I walked to the beginning of the trail, I felt alot of anxiety. I looked at the snow and wondered if I could really do this again. 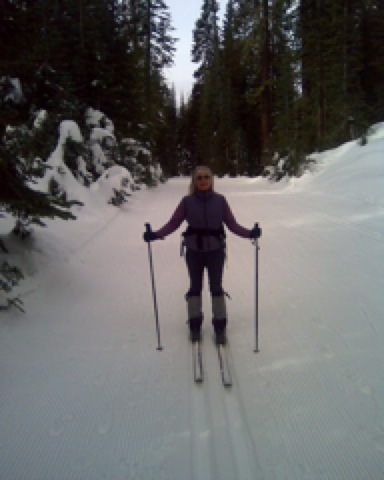 As I put on my skis, I repeated the Ananda yoga affirmation, “I am safe. I am sound. All good things come to me. They give me peace”. When I came to the first icy hill (not a very big one), I took off my skis and walked down it. The up hill was no problem. I felt strong and able. As we continued, I repeated the affirmation,” Strength and courage fill my body cells. Joy descends to me!”. Thank you, Ananda yoga, for giving me something positive to focus on while my brain and body came into sync. It was a good day! Horray! You look marvelous out there. So great of you to be brave enough to ski and also strong enough to know & accept your limits — for now. Love you, MOG1 – I will remember this affirmation when I get in a scary situation.